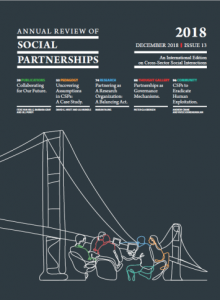 Homepage > News > The new issue of the Annual Review of Social Partnerships is out! – A review of more than 120 publications on CSPs from 2017/2018, highlighting a growing scholarly focus on better understanding how CSPs and the involved organizations can contribute to grand challenges, such as those addressed by the Sustainable Development Goals. – A collection and discussion of pedagogical tools on dealing with assumptions in CSP pedagogy and practice. We present a portfolio of personal accounts and suggestions around dealing with assumptions, a related case study for teaching and practice, a practitioner interview, and a teaching innovation to uncover assumptions based on The LEGO® SERIOUS PLAY® Method. – A compilation of recent insights into CSP research, for example, with respect to meta-governance of CSPs and the challenges of a large collaborative research program on climate change, agriculture and food security. You will learn about Proudly Made in Africa and its partnerships from a research perspective, as well as about the role of academic research according to the Head of the Private Sector Team at Oxfam GB. – A thought piece by Prof. Pieter Glasbergen on partnerships as governance mechanisms for sustainable change. – Insights and community views into the challenges and opportunities of CSPs as an alternative to address human exploitation in businesses, including academic and practitioner interviews and a discussion of the role of big data in bringing actors together and causing new challenges. Issues 7-13 are available here.